A standard 61-cm bongo net fitted with 0.333-mm mesh used in plankton sampling. 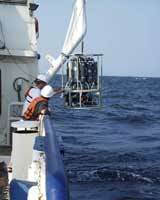 Plankton samples are taken at stations arranged in a systematic grid across the Gulf of Mexico. Such a grid is chosen because of the large survey area. Stations are set at minimum intervals of 30 miles (1/2 degree) and during the Fall Plankton Survey, Mississippi samples stations set at intervals of 6 nautical miles. A 2x1-m neuston net fitted with a 0.948-mm mesh net. The neuston net is towed at the water's surface to sample plankton. Plankton sampling gear consists of standard 61-cm bongos and a 2x1-m neuston net for the large vessels. The bongos are fitted with 0.333-mm mesh nets with either hard (PVC) or soft (0.333-mm mesh net) cod ends. The neuston net consists of a 2x1-m pipe frame fitted with a 0.948-mm mesh net on which the cod end is tied off. At each designated plankton station, either an oblique bongo and surface neuston tow or a surface neuston tow is made. At bongo stations a standard oblique tow is made to 200 m, or to 2 m off the bottom at depths less than 200 m. Neuston tows are made at the surface with the net half-submerged for 10 minutes at a vessel speed of 1.5 knots. All ichthyoplankton components (eggs and larvae) are removed from each sample and the fish larvae identified to the lowest feasible taxon (families in most cases). Larval fish that were caught during routine plankton surveys. The fish are sorted, identified, and stored for curation. The objectives of the Spring Plankton Survey are to collect ichthyoplankton samples for estimates of the abundance and distribution of Atlantic bluefin tuna larvae and collect environmental data at all ichthyoplankton stations. Plankton samples are taken with standard SEAMAP bongo and neuston samplers. In addition, hydrographic data (surface chlorophylls, salinity, temperature and dissolved oxygen from surface, midwater and near bottom, and Forel-Ule color) are collected at all stations. The objective of the Fall Plankton Survey is to collect ichthyoplankton samples with bongo and neuston gear for the purpose of estimating abundance and defining the distribution of eggs, larvae, and small juveniles of Gulf of Mexico fishes, particularly king and Spanish mackerel, lutjanids and sciaenids. Plankton samples are taken with standard SEAMAP bongo and neuston samplers. In addition, hydrographic data (surface chlorophylls, salinity, temperature and dissolved oxygen from surface, midwater and near bottom, and Forel-Ule color) are collected at all stations. The Winter Plankton Survey is a biannual survey. The objectives of the survey are to assess the occurrence, abundance and geographical distribution of the early life stages of winter spawning fishes from mid continental shelf to deep Gulf waters; measure the vertical distribution of fish larvae by sampling at discrete depths in the water column using a 1-meter Multiple Opening and Closing Net Environmental Sensing System (MOCNESS); and sample the size fraction of fishes that are underrepresented in bongo and neuston samples using a juvenile (Methot) fish trawl. A CTD about to be deployed overboard. The CTD is used to measure environmental data at the surface, mid depth, and bottom. Vessel: Vessel code for each vessel. Station: Station identifiers vary by state and vessel. Cruise: Cruise numbers vary by state and vessels. Time: Local time and time zone, recorded at the start of sampling. Barometric pressure: Recorded in millibars. Wave height: Estimated visually in meters. Wind speed and direction: Recorded in knots with direction recorded in compass degrees from which the wind is blowing. Air temperature: Recorded in Centigrade. Cloud cover: Estimated visually in percent cloud cover. Secchi depth: Secchi depth in meters, estimated at each daylight station. Standard oceanographic 30-cm white discs are lowered until no longer visible, then raised until visible. If different depths are recorded, an average is used. Water Color: Forel-Ule data is recorded. A bottle sampler used to obtain water samples at the surface, middle depth, and bottom for environmental analysis. Water temperature: Temperatures are measured by a hand-held thermometer or by in situ electronic sensors onboard ship. Salinity: Salinity samples are collected by Niskin bottles and stored for laboratory analysis with a salinometer. Conductivity probes or refractometers are used on some vessels. Salinity samples are also measured with in situ electronic sensors. Chlorophyll: Chlorophyll samples are collected and frozen for later laboratory analysis. Laboratory analyses for chlorophyll a and phaeophytin a (a chlorophyll degradation product) are conducted by fluorometry and spectrophotometry. In addition, chlorophyll data are also collected using a CTD. This method only obtains measures of chlorophyll a and is a measure of fluorescence. Dissolved oxygen: Dissolved oxygen values are measured by electronic probes or by the Winkler titration method. Turbidity: Turbidity values are measured by electronic probes when equipment is available. 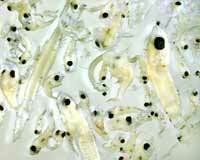 A mixture of shrimp that were captured during part of a SEAMAP trawl survey. All shrimp are separated from the trawl catch at each station. Total count and weight by species are recorded for each station. A sample of up to 200 shrimp of each species from every trawl is sexed and measured to obtain length-frequency information. Estimated total numbers are derived from the total weights of those processed. Objectives of the Summer Shrimp/Groundfish Survey are to monitor size and distribution of penaeid shrimp during or prior to migration of brown shrimp from bays to the open Gulf; aid in evaluating the "Texas Closure" management measure of the Gulf of Mexico Fishery Management Council's Shrimp Fishery Management Plan; and provide information on shrimp and groundfish stocks across the Gulf of Mexico from inshore waters to 50 fm. Emptying the net during a trawl station before sorting. Trawl stations sampled by NMFS, Florida, Alabama, Mississippi and Louisiana are made with a standard SEAMAP 40-ft net, and Texas samples with a 20-ft net. Diurnal stratifications were dropped in 2010 in the selection process, and geographic strata (which were mostly 2 to 3 statistical zone groupings) were changed to single zones. Both station selection methods, the old and the new, are probability based designs. With probability sampling, each unit in the survey population has a known, positive probability of selection. This property of probability sampling avoids selection bias and enables one to use statistical theory to make valid inferences from the sample to the survey population. More specifically, the new method employs probability proportional to size (PPS) sampling. In this type of sampling, a unit’s selection probability is proportional to its size measure which in this case is geographical surface area. For example, if Unit A has twice the surface area of Unit B, then Unit A will have twice the probability of having a sample selected from it than B. The end result is that Unit A will have about twice the number of samples as B. Even though diurnal strata were dropped in the sampling site selection process, this information is not lost since samples can be post-stratified. Following is an example of how sampling sites are now selected. Bathymetry data were downloaded from the National Geophysical Data Center web site. Because of the magnitude of data, they were downloaded by single Gulf Coast Shrimp Statistical Zones (the download process allows for the definition of a desired data block through user supplied latitude and longitude boundaries). Since the data definition process is controlled by latitude and longitude only, some undesired depths were included in downloads (i.e., for NMFS, depths less than five or greater than sixty fathoms). These records were deleted later through a Statistical Analysis System (SAS) program. Each bathymetric record represents a 3 arc-second element of data (≈ 0.05-by-0.05 minutes of latitude and longitude); therefore, the number of data records was used as a measure of size for each respective statistical zone. The bathymetry data were then used as input to a SAS program which performed three functions; defined the sampling universe, determined the sampling proportions according to sizes of statistical zones, and randomly selected the sample sites according to the defined proportions. A typical trawl catch of fish and invertebrates before sorting and identification. All species are identified, enumerated and weighed. Weights and individual measurements are also conducted on selected species. All Penaeus spp. shrimp are separated from the trawl catch at each station. Total count and weight by species are recorded for each station. A sample of up to 200 shrimp of each species from every trawl is sexed and measured to obtain length-frequency information. Estimated total numbers are derived from the total weights of those processed. 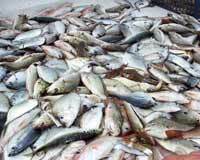 Other species of fishes and invertebrates are identified, enumerated and weighed. Weights and individual measurements on selected species other than commercial shrimp are also recorded. 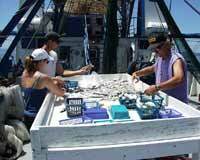 A catch from the trawl survey being sorted before being identified and weighed. The objectives of the Fall Shrimp/Groundfish Survey are to sample the northern Gulf of Mexico to determine abundance and distribution of demersal organisms from inshore waters to 60 fm; obtain length-frequency measurements for major finfish and shrimp species to determine population size structures; collect environmental data to investigate potential relationships between abundance and distribution of organisms and environmental parameters; and collect ichthyoplankton samples to determine relative abundance and distribution of eggs and larvae of commercially and recreationally important fish species. A red drum, Sciaenops ocellatus, that was captured during part of a SEAMAP trawl survey. 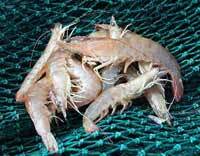 The design of the fall survey is similar to the Summer Shrimp/Groundfish Survey. All organisms that are caught in the trawls are treated in the same manner as the Summer Shrimp/Groundfish Survey with the exception to shrimp catches where only 20 shrimp of each species from every trawl are measured, although Louisiana measures a minimum of 50 shrimp. Juvenile red snapper, Lutjanus campechanus, that were captured during part of a SEAMAP trawl survey. The primary purpose of the Reeffish Trap/Video Survey is to assess relative abundance and compute population estimates of reef fishes found on natural reef fish habitat in the Gulf of Mexico. Two types of gear are used to deploy video cameras: 1) a single-funnel fish trap (2.13 m long by 0.76 m square) with the camera mounted at a height of 25 cm above the bottom of the trap; or 2) a 4 camera array with 4 cameras mounted orthogonal to each other at a height of 25 cm above the bottom. Both gears are baited with squid before deployment. The resultant video recordings (typically of one hour duration) are processed back at the laboratory where fishes are identified and counted independently by two tape readers. Final counts are entered into the SEAMAP reef fish database along with additional observations on habitat and fish activity. Measuring a red grouper, Epinephelus morio, captured during the SEAMAP Vertical Line Survey. 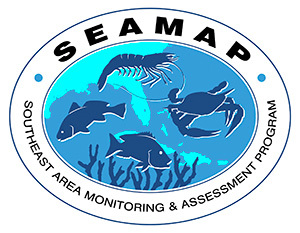 The primary purpose of the SEAMAP Vertical Line Survey is to characterize the spatial and temporal distribution of commercially and recreationally important reef fish species in the coastal waters of the five Gulf of Mexico states and the adjoining Exclusive Economic Zone. Fisheries-independent data characterizing population dynamics of fish assemblages on non-structured and structured bottom habitats (i.e. natural hard bottom and artificial structures) in offshore waters is also obtained. A typical commercial bandit rig is used and holds approximately 500 feet of clear 300 lb. test main line. A 24 ft. backbone (leader) is attached to the terminal end of the main line. Clear 400 lb. test monofilament is used in the construction of the backbone. An approximately ten pound weight is attached to the terminal end of the backbone. The backbone is rigged with ten 18 inch long gangions at intervals of two feet. All hooks are Mustad 39960D circle hooks, sizes 8/0, 11/0, and 15/0. Each backbone contains 10 gangions of the same hook size. Each bandit rig is randomly assigned a hook size at the first station. Longline gear used during the SEAMAP Inshore Longline Survey. The SEAMAP Inshore Longline Survey survey complements an existing long-term fisheries independent survey currently being conducted by NOAA Fisheries, by targeting shark and finfish species within the shallow waters of the north central Gulf of Mexico. The objectives of the survey are to collect information on coastal shark and finfish abundances and distribution with a 1-mile longline and to collect environmental data. One hundred gangions and hooks are attached equal distance along the 1-mile longline. The hooks soak for one hour.